Setting boundaries can keep your cat off the stairs. If the stairs are off-limits to your cat, you might have a hard time controlling her, because cats enjoy being high up and overlooking and investigating their surroundings. Some simple adjustments and deterring techniques can teach your finicky feline what her boundaries are and keep her from getting in trouble. Surprise your cat with a tall cat tree so she can satisfy her urge to climb and sit up high. Get her a cat tree with several perches for lounging so she feels like she can overlook her kingdom and forgets all about climbing the stairs. Lay an upside-down carpet runner on the stairs if you're not home to supervise your cat. When your cat attempts to climb the stairs, she'll feel the nubby surface of the runner under her paws. The unpleasant feeling might make her think twice about climbing the stairs. 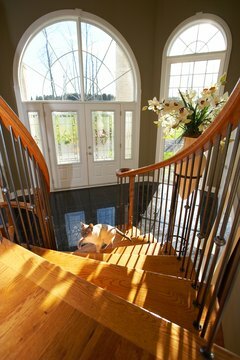 Startle your cat the moment you see her eying the stairs or when she's about to go up the stairs. Shake a can of coins, blow a whistle or squirt her with a water-filled spray bottle to stop her in her tracks. Do this consistently each time you catch your furry friend in the act and eventually she'll stop using the stairs just to avoid the unpleasant consequences. Install a commercial deterring device to keep your cat from going up the stairs. Motion-activated devices that blow air when triggered, or upside-down plastic mousetraps hidden under newspaper, can startle your cat away from the stairs. Spray the stairs with a scent that your cat dislikes. Use a commercial cat repellent, or use a cologne or citrus-scented spray. Alternatively, scatter lemon or orange peels on the stairs. Avoid yelling at your cat when you catch her on the stairs -- it's ineffective and your pet companion might start fearing you. Is Transmission Fluid Toxic to Cats? Do Indoor Kittens Really Need a Follow-Up Booster? Is There a Cat Repellent to Keep Them Away From Birds? Can Not Getting Your Cats Spayed Hurt Them?